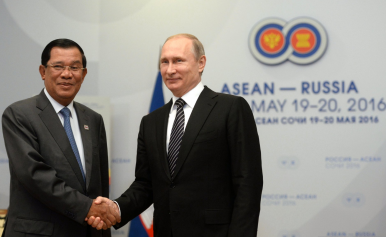 Cambodia: Russia's Gateway to ASEAN? Russia’s outreach to Cambodia is part of a larger strategy to increase influence in Southeast Asia. On May 17, 2016, Cambodian Prime Minister Hun Sen held bilateral talks with Russian Prime Minister Dmitry Medvedev to strengthen economic linkages between Moscow and Phnom Penh. These talks resulted in the two countries signing a landmark agreement to cooperate on peaceful nuclear energy development. At the Association of Southeast Asian Nations (ASEAN) summit in Sochi that followed, Russia and Cambodia announced cooperation in numerous economic sectors and took major steps toward the establishment of a durable economic partnership. Russia’s strengthening of ties with Cambodia is a key component of President Vladimir Putin’s broader goal of expanding Russian influence within the ASEAN bloc. Medvedev’s historic trip to Phnom Penh in November 2015 further underscored the importance of Cambodia to Putin’s Southeast Asian strategy. Medvedev’s trip was first official visit of any Russian leader to Cambodia since Soviet Foreign Minister Eduard Shevardnadze traveled to Phnom Penh in 1987. These diplomatic overtures are a major step toward resolving strains between Russia and Cambodia that have lingered throughout the post-1991 period. Despite this progress, the transition towards a genuinely fruitful Russia-Cambodia partnership is still fraught with obstacles stemming from inefficiencies in Cambodia’s economic system, and negative historical legacies. In stark contrast to the current cordial relationship, economic cooperation between Phnom Penh and Moscow was almost non-existent in the years immediately following the Soviet Union’s collapse in 1991. Russia’s alliance with Vietnam damaged ties with Phnom Penh, as Cambodian nationalists disdained the memory of being a de facto Vietnamese puppet state from 1979-1989. While bilateral agreements like the 1995 Intergovernmental Agreement on Trade and Economic Relations and the 1997 establishment of the Intergovernmental Commission on Trade, Economic, Scientific, and Technological Cooperation formalized economic relations between Russia and Cambodia, trade volumes only began to appreciably increase during the mid-2000s. Russian ambassador to Cambodia Dmitry Tsvetkov noted in a 2014 statement that bilateral trade linkages had expanded from $10.8 million in 2006 to $133.2 million in 2013. As Russia-Cambodia trade linkages have expanded, the drivers of economic cooperation have shifted from business-level to inter-governmental connections. This transition has been particularly striking in agriculture. Cambodia has historically exported milled rice to Russia and Eastern Europe through private companies like Mekong Oryza. But the May bilateral summit formalized a path for the Cambodian government to oversee the export of agricultural products. Cambodian rice producers hailed this development as a major step forward for the Phnom Penh-Moscow relationship. Trade expansion in the agricultural sector has provided a powerful precedent for deepened Russian investment in Cambodia’s energy facilities, mining equipment, and telecommunications industry. Hun Sen praised this diversification in a May 20 statement, arguing that Russian private sector investment could play a vital role in Cambodia’s economic development process. Russian Deputy Foreign Minister Igor Morgulov responded to Hun Sen’s statement by suggesting that Cambodia, Singapore, Indonesia and Thailand could create a Southeast Asian free trade zone linked to the Russian-led Eurasian Economic Union (EEU). This trade agreement, if realized, would substantially elevate Russia’s position as an economic competitor with China and the United States in Southeast Asia. Despite numerous signs of progress toward a lasting Russia-Cambodia economic partnership, three obstacles could slow down or ultimately prevent this alliance from coming to fruition. The first problem lies with the regulatory and planning bodies of the Cambodian economy. Mekong Oryza managing director Hun Lak recently expressed concern that Cambodia’s approach to cooperation with Russia has focused on developing state and private sector cooperation independently, rather than as part of a joint process. Also, even though the Cambodian government has implemented initiatives to lower electricity prices, cut taxes, and streamline the bureaucracy; Cambodia’s rice industry still incurs higher production costs than its Southeast Asian neighbors. These excess costs could eventually cause Russia to divert its investments toward Vietnam, Thailand, and Laos, and cause Cambodia to miss out on much-needed foreign capital. Second, Russia’s and Cambodia’s comparative advantages and sources of economic strength do not readily complement each other. This lack of synergy became evident in 2015, when the volume of trade between Phnom Penh and Moscow fell by 16 percent. Both countries have attempted to rectify this problem by expanding the range of sectors for economic cooperation and making these new deals binding until 2020. But regional business leaders like Stephen Higgins of Mekong Strategic Partners contend that trade with Russia will not significantly bolster Cambodia’s economic development, as Russia’s economic strength lies in cheap fossil fuel exports. Third, Cambodia needs to be cautious to ensure that closer ties with Russia do not jeopardize or dilute its long-standing alliance with China. Phnom Penh has maintained close ties with China since the rise of the Khmer Rouge regime in 1975 and has historically viewed a close relationship with Beijing as a bulwark against Vietnamese hegemonic ambitions. Despite this long-standing partnership, Cambodia has been careful to demonstrate to the international community that it has foreign policy independence and is not completely beholden to China. Hun Sen’s critics regarded Cambodia’s pro-Chinese position on the South China Sea dispute at the recent ASEAN summit as proof of Phnom Penh’s dependency on China. Pivoting in a limited way toward Russia could be effective in demonstrating that Cambodia is not merely a compliant satellite in Beijing’s sphere. Russia’s close ties with Vietnam also remain source of friction between Moscow and Phnom Penh. A senior Cambodian diplomat recently told Russia Beyond the Headlines (RBTH) that Cambodians still fear Vietnamese aggression, even though Vietnam’s military modernization is primarily aimed at confronting China. Putin can counter skepticism of Moscow’s intentions and credibility as a strategic partner by strengthening Russia’s cultural linkages with Cambodia. In particular, Russia-Cambodia ties could strengthen greatly if Putin actively promotes Russia’s already robust tourism linkages and showcases the quality of Moscow’s university student exchange programs. Cambodia’s liberal visa laws allow 131,000 Russians seeking a warm winter vacation spot to visit every year. Closer economic ties and the Russian government’s increased attention to Cambodia should expedite the growth of tourism further. In addition, Cambodia has 8,000 students studying in Russian universities, and a history of student exchanges that date back to the Soviet era. These educational linkages will help ease distrust of Russian intentions amongst the younger generation of Cambodians. It also will impact long-term policy decisions, as Cambodians educated in Russian academies are disproportionately represented in senior government positions. Russia’s diplomatic overtures toward Cambodia are a crucial step towards establishing Moscow as a major player in the ASEAN trade bloc. Ultimately though, the success of Russia’s outreach will depend on Putin’s ability to overcome Cambodian disdain for Moscow’s alliance with Vietnam and Cambodia’s willingness to make sweeping economic reforms that will bolster its viability as a trade partner. Samuel Ramani is an MPhil student in Russian and East European Studies at St. Antony’s College, University of Oxford, specializing in post-1991 Russian foreign policy. He is also a journalist who contributes regularly to the Washington Post, Huffington Post and Kyiv Post amongst others. He can be followed on Facebook at Samuel Ramani and on Twitter at samramani2. Warships Spotlight China-Cambodia Defense Ties Amid Military Base HypeChina, Cambodia Boost Cooperation During Hun Sen’s VisitChina and Cambodia Hold Their Biggest Military Exercise YetChina-Cambodia Military Fears in the Headlines with New US Intelligence ReportA New Cambodia-Laos Border Deal?